When it comes to health insurance, it is easy to get lost in the sheer mass of what’s on offer. Choice is great if you know what you’re looking for, otherwise it can be just plain confusing. With the help of an expert, we have taken a look at five popular health insurance providers with pregnancy coverage to help you work out how to choose the best policy for you. Canstar General Manager of Wealth Josh Callaghan tells Babyology there are two main structures for how pregnancy coverage is offered by health insurance providers. Josh says there can be advantages and disadvantages in both structures and often the best option for you will come down to budget. “The disadvantage of going for top hospital cover is you tend to be paying for things you don’t need,” Josh says. But, he says, there are always exceptions to the rule. “That’s the beauty of this industry, there are exceptions to the rules, and on certain occasions the top hospital cover that does cover everything might actually be cheaper than a mid-level cover with obstetrics as an addition,” Josh says. While these five options are available Australia-wide, Josh says it is also worth looking into options only available in your state or territory, as there are some great providers with policies worth considering. Looking nationally, Josh found the five cheapest health insurance policies currently available with full pregnancy cover as examples. With the HIF Gold Saver Hospital, policy holders are covered for a private room for maternity services (up to three days) as well as a number of non-pregnancy related medical needs. This policy has the cheapest monthly repayment of the five policies in this comparison and includes restricted coverage for IVF-related hospital stays. 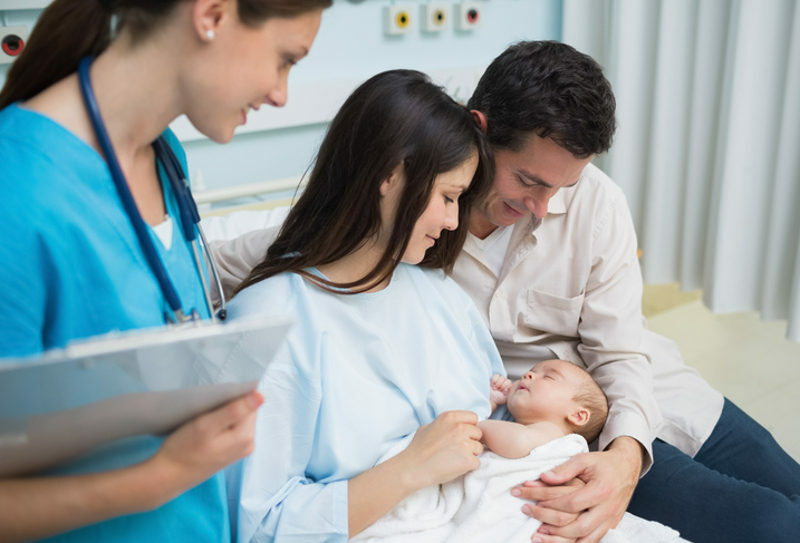 This policy will not waive the excess for dependants, which means if your baby requires admission to hospital, you will have to pay the excess. This isn’t necessarily a deal breaker though, as many policies require an excess for babies, which could be offset by the cheaper premium paid for the policy. It is also worth noting that full ambulance cover is not provided under this policy and, if your only choice is a private room, during hospital admission you may have to make a co-payment per night. This policy costs $197.37 per month based on a $200 excess for hospital admission. The Mildura Health Fund Five Star Hospital offers 100 per cent private hospital cover Australia-wide, with various excess options available depending on the monthly premium you choose to pay. The flexibility to choose the excess option provides an opportunity to secure a lower monthly premium, which could appeal to those with a firm budget. Hospital fees related to assisted reproduction such as IVF are also covered under this policy. This policy will not waive the excess payable for dependants. This policy costs $218.75 per month based on a $500 excess for hospital admission. The CDH Benefits Fund Excess2 Silver Hospital Cover includes coverage for hospital treatment, including accommodation as a private patient in a private or public hospital, doctors’ bills in hospital and comprehensive cover for ambulance. Nine out of 10 medical services paid for by this health insurer in all states have no out-of-pocket expenses. IVF is not covered under this policy and an excess for dependants is payable. This policy costs $226 per month based on a $500 excess for hospital admission. With Budget Direct Top Hospital, you are covered for obstetrics and hospital accommodation in a shared room, as well as quite a number of things not pregnancy related. IVF-related hospital stays are covered and the excess for dependants is waived. It also has a provision for waiving the usual waiting periods for things such as obstetrics, if you transfer from another fund and can prove you already served those waiting periods with the previous provider. This policy costs $239.50 per month based on a $450 excess for hospital admission. With Bupa’s Standard Hospital you are covered for pregnancy and childbirth, as well as hospital accommodation and all operating and ward fees incurred as an inpatient. The excess for dependants is waived under this policy. While coverage is restricted, some IVF-related hospital expenses are included. This policy costs $244.81 per month based on a $500 excess for hospital admission. We have looked at these five policies as examples of what is currently available in Australia, but remember that they may not necessarily be the right fit for you. The best way to navigate your way through the clutter of health insurance offerings when preparing for pregnancy is to ask loads of questions. And, as a starting point, try these seven questions to ask your private health insurer before getting pregnant.